Once in a while a new musical talent emerges who defies all preconceived notions or ideas. These rare talents help to define popular culture and shape society at large. Nominated for "Most Promising Entertainer" at the 2005 International Reggae & World Music Awards, ISIS is truly redefining Reggae music. The child of a Welsh mother, a Moroccan father, and a Ugandan stepfather who adopted her – Empire ISIS, was raised in Montreal, Canada, and Morocco. ISIS grew up with a genuine love of theater and a strong social consciousness which would help her in the years to come. At the age 16, ISIS set off for South and Central America, bicycling through 7 countries from Panama to Mexico, performing with a regional traveling theater group, and appearing in TV shows like HBO Ole. Her adventures in Latin America ignited the spark, and in the rolling hills of JA, ISIS found Reggae to fan the flames . . . landed next in Jamaica, she filmed a documentary about the BoBo Shanti; an isolated group of strict Rastafarians in the hills of Jamaica that gave birth to conscious dancehall pioneer, Sizzla. 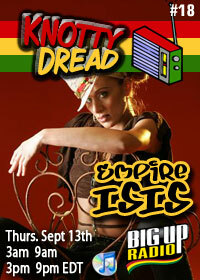 AND RIGHT AFTER KNOTTY DREAD RADIO….